Since moving away from Chicago almost ten years ago, I still get all big-city nostalgic for a few things, one of which is the Maxwell Street Sunday Market. Maxwell Street is a street in the southwest edges of downtown Chicago famous not only for its long-standing outdoor market, but also for being credited as the birthplace of Chicago Blues. The area has also played host to just about every immigrant population the city has seen, and still is home to the Hull House, a “settlement house” co-founded by Jane Addams and Ellen Gates Starr in 1889 to help newly landed immigrants not only adjust, but flourish in their new home. Although the Jane Addams Hull House Association still serves the Chicago community, the original Hull House—now a museum—has been taken over by the ever-expanding University of Illinois at Chicago (UIC). It should come as no surprise that UIC has also displaced the market itself (twice) from its long-standing original location to another nearby though not-nearly-as-great location at Des Plaines and Roosevelt. It should also come as no surprise that the Maxwell St Market vendors continue to be made up of a lot of recent immigrants, in this case mostly Mexicans. The Maxwell Street Market in Chicago has long been the standard to which outdoor markets in this country have been held to. It has been around since at least the 1871 Chicago Fire, and has hosted all varieties of cultures, but in recent memory it has been like walking into a large Mexican outdoor market, complete with everything you may need to everything you never knew you needed until you saw it used and at a discount: socks, wrenches, toys, CDs, car parts, bikes, home appliances and just about everything else, including of course, tacos. And if you’re really lucky or on the in, maybe someone will even slip you a can of Tecate. 10 yr old cell phone, flask, antlers, iron, matching large calculators, portable CD player. All in one trip! This trip I went with another friend of mine who embodies the cultural mix that makes our country so great: a red-haired and bearded pale-faced man of Irish descent who, based on a combination of his unique upbringing and lifestyle choices, oozes Mexican from all his pores. We pulled into a parking lot near the market and before he could say anything the attendant started talking to him in Spanish. I figured he knew the guy. Nope. "That happens to me all the time," he said, shrugging his shoulders. The funny thing is that it really does. Pretty much as soon as we got out of the car the rain started, though it was refreshing since the previous days were hot and humid by my dry-air Denver standards. Our mission was two-fold: find a guy that my friend owed eight dollars to (for a bike he bought his son recently), and eat as many tacos as we could. 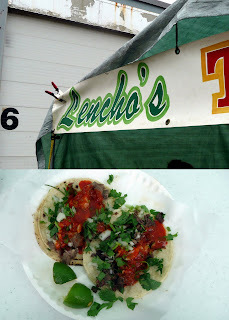 Our first stop was Lencho’s. Lencho’s is at the northern end of the market and on this rainy day sat almost alone under the shadow of the Sears Tower (I know it’s the Willis tower now, just doesn’t sound right). Lencho serves a mean taco de carne asada. Under a plastic canopy tent with the cool morning rain starting to pick up, it was a nice warm and spicy start to the day. Even better, however, was the lengua: moist and rich with flavor like any good tongue should be, I quickly devoured it after my steak one. Then we started wandering the market, stopping pretty often to greet one of my friend’s market-stall amigos. With the rain and cool wind, the overall atmosphere that day was relatively quiet and reserved. There was still loud music bumping everywhere, but no Corona’s were being passed under the tables and the crowd was a little thin. Nevertheless we were able to track down the guy he owed money to, and from there went on to eat some more tacos. But first we stopped at a Churro truck and got some vanilla and strawberry-filled fried delights before attacking the row of pastor stalls. There were several taco stalls with glowing-red spits of stacked pork loins, and we stopped at Manolo’s first. I ordered two tacos al pastor along with a quesadilla with flor de calabaza. It deviates from the original mission, but it isn’t that often that I come across zucchini flower-filled quesadilla in the US, so I had to try it. It was a lovely version in a sweet tomato sauce, thick with oozing cheese and wrapped in a hearty homemade corn tortilla. Manolo’s turned out to be a major hurdle in the taco hunt, as each taco came out two or three times the size of what I expected. On the homemade thick corn tortillas it was almost like a taco arabe (pastor tacos in places like Puebla) but with a thicker tortilla made of corn. Whatever it was, it was delicious. The pastor marinade was flavorful though a little too salty and the pieces of pork were nicely charred as well. Here is Manolo's spit, almost lost among the fan, Beatles poster and other necessary miscellany of what is essentially a portable taco stand. I had to make one more stop even though I was more than full from Manolo’s, Lencho’s, the churro truck and the previous several days of gluttony that always mark my Chicago visits. I was glad I did stop at La Flor de Mexico, because it was the best taco of the day. Thinly sliced and beautifully charred, dotted with pineapple (albeit canned) and also in a homemade tortilla—though of a more reasonable size. And here is their spit. Well-used that day and a little sad looking. But, if we've learned anything together on this blog, it is that a well-manicured spit doesn't always yield the best taco al pastor. It was a great day at Maxwell St. thanks to Lencho, Manolo and La Flor. It's good to see that Maxwell St. continues to survive and adapt with all the changes over years, and let's all hope that it will be there for years to come. You can visit La Flor anytime in Pilsen. Lencho's and Manolo's are Maxwell St exclusives.